In a series of blog posts, the museum’s curatorial team will take visitors on a journey through many of its collection treasures that have not been seen before. Since becoming the Museum of Australian Democracy the Museum’s collecting priorities and aims have broadened to include objects that tell stories about Australia’s democratic history and traditions, rather than just about Old Parliament House itself. Recently a political board game called ‘Question Time’ was released and has made the news for talking about Australian politics and democracy in an unusual way. However, political board games are nothing new. The Museum has several existing ones in its collection. The oldest example of these games comes from 1909, and is called the “Pank-a-Squith”. It is a game of female suffrage, and is named for suffrage campaigner Emmeline Pankhurst (1858-1928) and British Prime Minister Herbert Asquith (1852-1928), who was strongly opposed to giving women the vote. The game’s object is simple: get your token (a suffragette) to the centre of the board (Westminster) by rolling one dice at a time. There are many obstacles represented, as well as help. There are policemen to dodge, Bow Street magistrates to overcome, stints in prison and of course Asquith himself – landing on his square sent you back eight spaces! 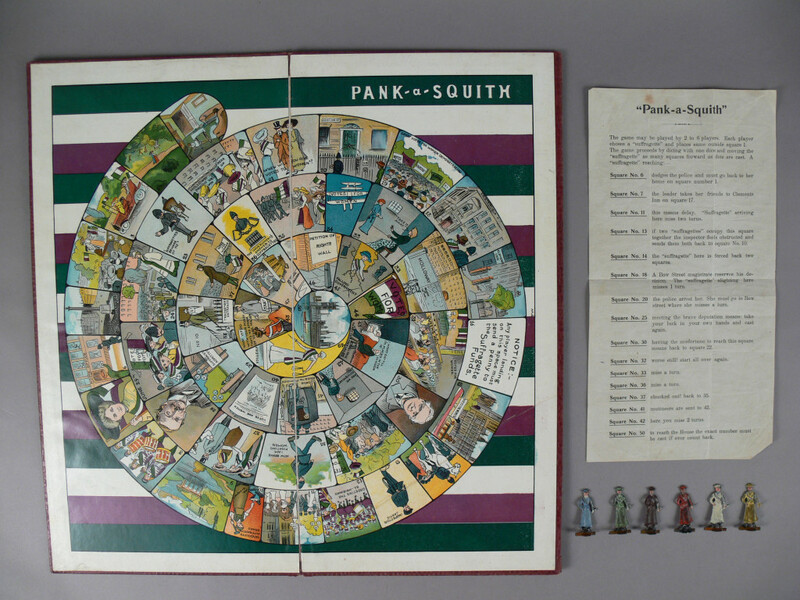 The Pank-a-Squith is a good example of a satirical board game made with a real and powerful message in mind. The Pank-a-Squith has been displayed in the From Our Collection space in the past, and we are always hopeful we will be able to show it off again! 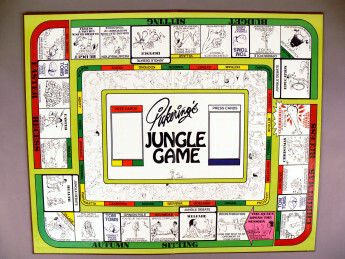 Another game dates from about 1980 and is the work of the distinctive and often controversial cartoonist Larry Pickering. The game is called “Pickering’s Jungle Game” and is about the cut-and-thrust of politics and electioneering. The rules of the game are quite complex, and revolve around trading and collecting cards worth a certain number of votes, and using those votes to buy and trade seats in Parliament. The player with the most seats becomes the Prime Minister (nicknamed “Four-Eyes”), who can pass legislation designed to help him retain his votes and seats. The game is notable for its artwork, all Pickering’s work, and his unique style is very much in evidence. Notice his regular caricatures of Fraser and Hawke making appearances (Fraser, as always, is depicted with a pipe when he did not, in fact, smoke). The game is irreverent but cleverly designed to simulate Australian political discourse at the beginning of the 1980s. 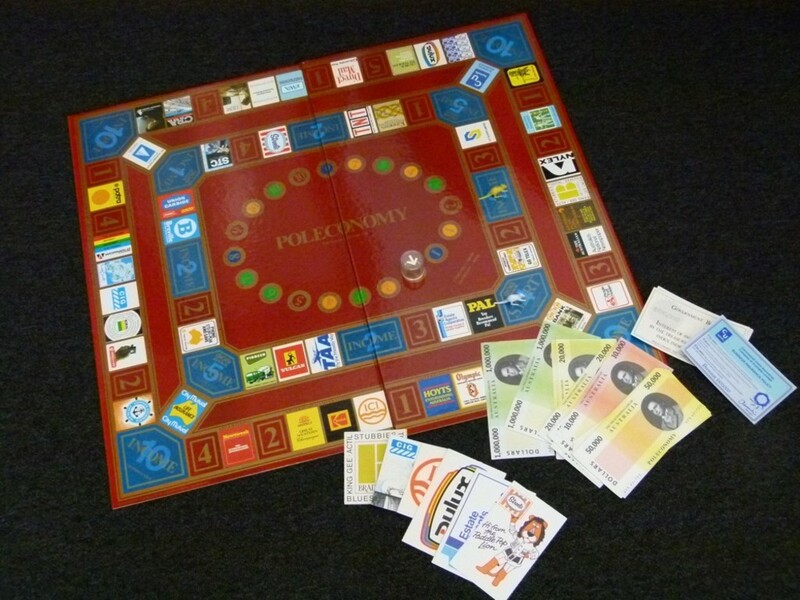 Taking a somewhat more serious tack on the same subject is the board game “Poleconomy”, published by John Sands in 1980. Poleconomy sees players become both business tycoons and political figures. Players move their kangaroo-shaped tokens around the board, accumulating businesses and advertising contracts, buying government bonds, insurance and inadvertently sending inflation rates up or down. One player, the Prime Minister (determined by regular dice-rolling ‘elections’), has a lot of power, can influence inflation, issue bonds and even pay themselves a fortune out of the Treasury! A look at the board shows the game’s age: most of the companies it features no longer exist. Also from the eighties is a game which capitalises on the popularity of Yes Minister and Yes Prime Minister. 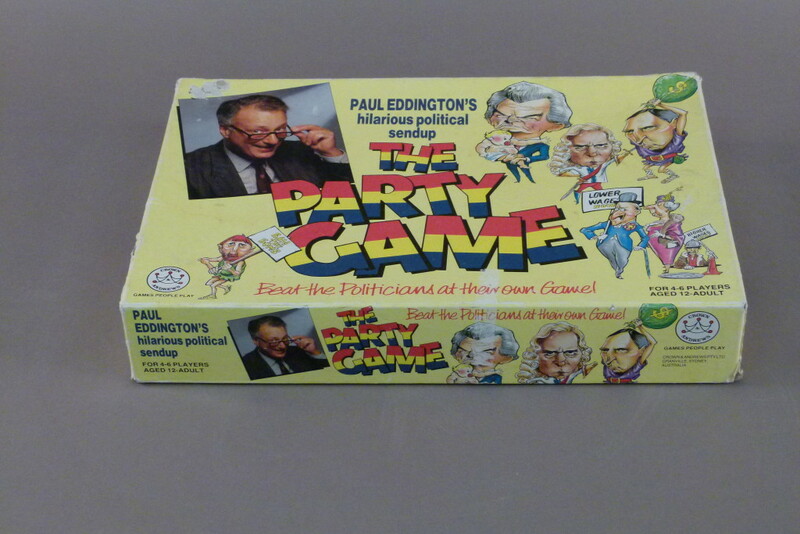 Entitled “Paul Eddington’s The Party Game” it is a satirical take on Australian politics rather like the Pickering game above. The game’s board and box feature caricatures of Janine Haines, Gough Whitlam and Paul Keating, among others, and has similar rules to the Pickering game – it is all about dealing in votes and trying to get ahead of the other players in the political stakes. What we find amusing is that the game has nothing whatsoever to do with Paul Eddington at all. He didn’t write it or produce it – his face is on the box, using his popularity as the star of Yes Minister as a marketing tool. The program was very popular in Australia and was a favourite of Bob Hawke: when Eddington visited Australia, Hawke treated him as a visiting head of government, and even had Eddington address a rally! Games form a vital part of a society’s culture, and these examples of board games serve as a reminder of the importance of recreational activities as a form of cultural and political expression. We are very pleased to be able to collect these games, and are always on the lookout for more examples to add to our collection. 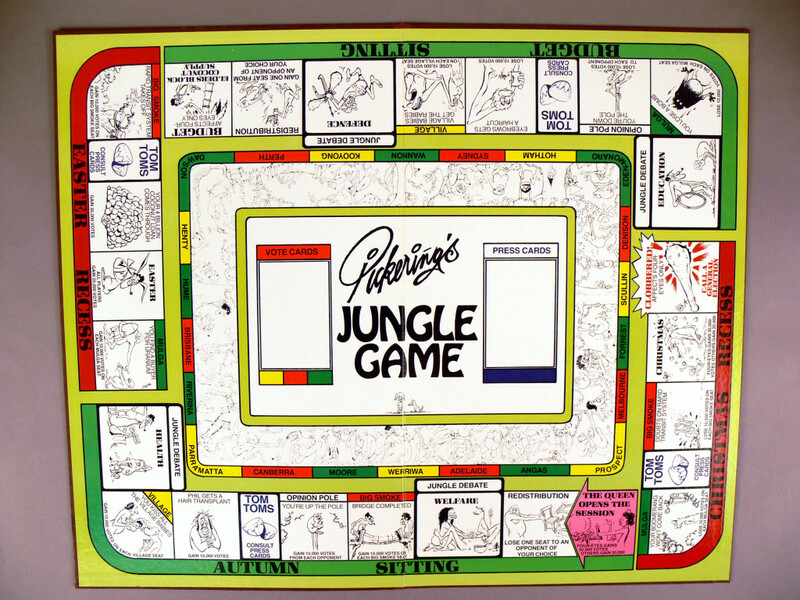 Image of the 1980’s board game: Pickerings Jungle Game.